As you probably already know I am a huge fan of anything pink, cute, princessy, etc, etc so I jumped all over this review. And let me tell you, I'm not disappointed. You can see the pattern of the actual lenses here and as you can see, the color printed on the lens itself is a pale, salmon pink with a bit of a rippled sunburst pattern fading into a black limbal ring. All in all, I really really love these lenses! Even with the first wear, they were very comfortable to me and I wore them for around 4 hours with no problems. I have pretty sensitive eyes and often feel discomfort with lenses after as little as an hour but these didn't dry my eyes out and didn't make me dizzy either. Even plano lenses can be slightly... I don't want to say blurry, but a little wonky sometimes but these didn't have that problem. The only issue I had was since they were 14.5mm, the actual lens is quite large and I had troubles getting it into my left eye at first. Once it was on, it felt pretty good and didn't slide around my eyeball like some lenses do. Now, you'll have to forgive me because I got a little snap happy since these lenses are so cute! I'm just loving how they come out in pictures. They are probably one of the most flattering lenses in my collection! Barely purple-toned but not unnaturally so like my Adult Violets. More like a softer and cuter lens that I could wear on any ordinary day. So with no further ado, onward commencing with le pic spam! Smile with teeth, since it seems to always be requested. I know I look like I'm 12 here. Better that than looking old, M I RITE?? I did want to mention that I'm wearing Skin 79 Super BB Triple Functions (Hot Pink) bb cream that I also received from Pinky Paradise which so far I'm loving! Really makes skin look smooth and flawless. Will do a review once I test it out for a while longer. Nomming on a red bean paste bun? J/K it's really a cell charm from my friend Janie who runs Pretty and Cute. ;) You guys should visit and follow her personal blog here! OOOOH! I want those so bad! I saw them and freaked out. EOS needs to make some pink lenses. Wow you look soooooo beautiful here!! What eye products did you use? awww Jen, gorgeous as always! I was waiting for Eki to do her review on these too!! They are sooo natural looking on you. I am placing an order with PinkyParadise soon. I think i'll have to throw these pink ones into my order.. I want those lenses now hehe!! Jen, how was your double lids created in this post? did u use tape? Awe, Jen. You look flawless in your pictorials! Lol you definitely made me check out the website. I was an anonymous reader to your blog for awhile up until now! Lol keep up the fabulous work and thanks for your helpful tut. Alicia: Ah, thank you! I agree, warmer lenses look better on me since I have so much yellow in my skintone. I find cooler lenses tend to wash me out! Love the look! Were you wearing your double sticky eyelid tape? haha cut asian poses :P I love the contacts!!!! Jen, weird question, but what's the height of your eyes? from top to bottom? XD i'm just wondering how big they are and compare them to mine, to see if these lens might fit me or not. ^^ thanks. LOL you're so cute Jen! Whenever you mention that the color is pink, you become so happy haha. I love pink too, it's my favorite color <3 I saw your twitter update about these lens and i got really curious about them because well, they're pink LOL. They look great on you though. Like you said, they do look quite natural. I usually wear grey and brown when it comes to circle lenses but i want to try these out. Hopefully i won't look weird in them =/ The review was very helpful. Thank you! Looks really good on you!! but i wonder how they will be in natural daylight and flash. These are so gorgeous on you! The lenses are so, so pretty! Your FOTD is gorgeous too, what was your lip/cheek combo?? You are sooo pretty, my gosh. And I love your makeup here! can you do a makeup tutorial on this look? you look stunning! originally i couldn't find that lens on the website, but then i realized it was under the new product section. I love how it looks on you. I have never worn lens before but these ones are definitely tempting me, especially when it looks go great on you. what is the regular size of lens? is it dangerous at all to have such "big" lens? btw, are these prescriptions? thanks for the review. LOVE it! wow... it looks sooooo natural!!!!. I love it!!! it looks good on u!!!! very very pretty!!!!. Those lenses are beautiful and other-worldly! Your fobby poses are perfect too! Those lens look great =) You look stunning in these photos!! Absolutely beautiful! Okay, so out of ALL colors of the rainbow, I really did not think that PINK would look good as a circle lense. Jen, you've proved me so wrong. It looks STUNNING on you! OMFG, THOSE LOOK REALLY COOL. THESE ARE AMAZING. I WANT THESE. NOW. @ Serenie S. - Apparently there are such things as max pure pinks. i think, you can try asking soompi ? BTW it suit you very well, u're really pretty ! look gorgeous! would you mind sharing how this particular makeup was done?! oh please do the review for that bb cream! I've had my eyes on it for a while but wasn't sure about it. Have you used misshas bb cream? if so is it anything like it? get snap happy all you want! lol. you look so gorgeous! and I loved how you were really smiley in your video. you're more beautiful when you smile. and I would also think those lenses would make you look like you have blood shot eyes or something but they look really dolly on you. Hey Jen I've tried to go on Pinkyparadise website, but when i want to shop, sometimes page doesn't work, is it normal ? You don't have any problem when you shop on it ? Jen, you look so beautiful on those pix!! and ur wedding ring is sooo pretty! please show us the detail of ur ring~~ its soo pretty!!! omgg you're soooo photogenic... really really pretty T_T. The lense look soo good on you~ I love pink a lot as well! You look great in those pictures!!! And the pink contacts totally worked for you!! You gotta show us how you did you makeup and the double eyelid some day!!! you look so gorgeous in all the pictures :) but do the lenses look unnatural in harsher light? Hi Jen, I love your blog! You look stunning! Anyway, I was wondering what Solotica Hidrocor lenses you'd recommend for someone that wants a hazel/green look with dark red/brown eyes (like yours). I'm between the ocre and mel, but just don't know which to choose :/ thanks! Hi! Jen, would u recommend wearing those even w/o makeup??? I really want those lens esp. after seeing your review, but i usually don't wear makeup and i'm worried they'll look weird on me w/o makeup. DO you think it would look weird if i wear the pink lenses without make up on? Hi! Don't know if you'll even see this since this post was written so long ago, but I was interested in trying out circle lenses. They look great in photos, but are they too much in real life? I wouldn't want to scare anyone off, haha. i love those pink lenses on you!! 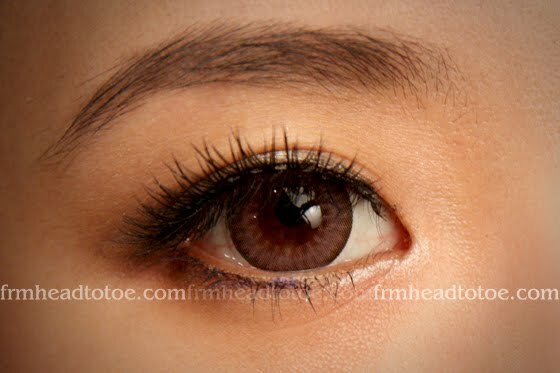 checked out pinkyparadise.com..
the display pics of the lenses seems a bit weird.. not the color shown in your youtube.. just want to make sure its the right one b4 i buy them! so is this the right one? thx! :) looking forward to your next video! Jen what kind of camera are you using to take these beautiful pictures? Jen, I never write reviews or comment on blogs but I felt compelled to since I purchased the skin79 bb cream off Pinky Paradise after I saw your review. I must say that it took me over a month to receive the product and when I got it I found it came from Malaysia. Since it's a Korean product I highly question why it was shipped from there. Also, the box had an expiration stamp for 2014 but the bottle was stamped January, 2012... I had ordered it March, 2012. Their site is also impossible to get a hold of. I hope you would consider my review when you're advertising for their site for the credibility of your name. Thanks. Hi Shells, the Pinky Paradise shop is indeed located in Malaysia and there are lots of Asian companies online that sell Korean products since Korean products are popular everywhere. 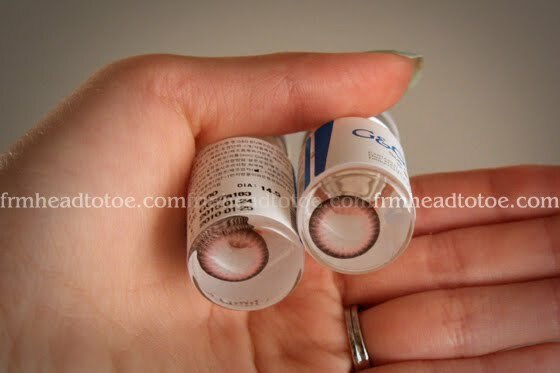 One thing to remember about Korean cosmetics and other products like lenses is that they print the manufacture date on the product instead of the expiration date. I will definitely keep your concerns in mind though, and speak with them when I get the chance! once again love love your blog! I can learn a lot from you. Your blog is really helpful. and i especially love your reviews!!! 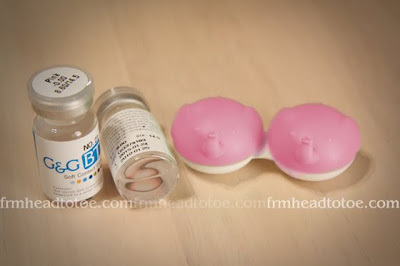 i'm planning to buy the G&G max pure pink lenses. but when i looked it up on the net, it seems that EOS also has max pure pink lenses. is there a difference between the two? if you don't mind, please email me at mai_mayorie@yahoo.com. THANKS!!! Good Day! !Love your blog! love those pink contacts on you! you look stunning amazing with them.